Frankie Sanders killed this 300-pound bruin on Game Management Land during South Carolina's 2017 bear season. A total of 108 bears were taken in Zone 1 for the 2017 season which included 61 males and 47 females. This number was only surpassed by the 2013 season when 127 bears were harvested. Still hunts accounted for 62 bears harvested, while 46 bears were taken during dog hunts. The still hunt numbers were higher than normal because the bears were moving to find food sources, putting them in contact with still hunters in higher-than-average numbers. The dog hunt groups usually purse the higher elevations because of the larger tracts of hunting lands, but this hunting season the bears moved to lower elevations due to the acorn production mentioned by Wactor. A significant increase in hog activity in the mountains also impacted the bear hunt. Frankie Sanders of Mountain Rest took a 300-pound bear during a still hunt on Game Management Land. This was the second bear that Sanders has collected since he started hunting bears years ago. “You just can’t go out into the woods and expect to get a bear,” Sanders said. “First you find a spot where the acorns are dropping, and then you have to find sign where the bears have been eating. The bears scoop up the acorns like a yard rake,” he said. 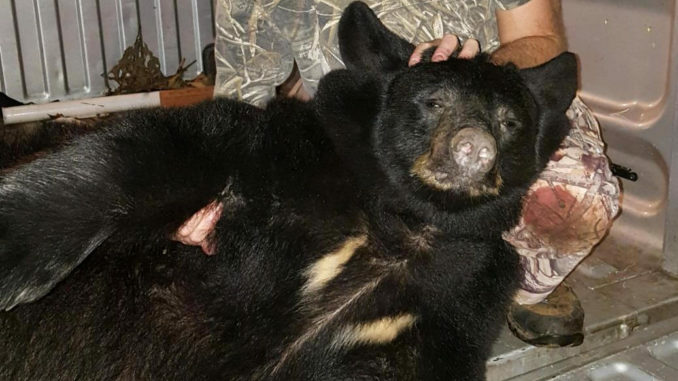 Oconee County had the most bears taken with a total of 46, including eight males and nine females taken by still hunters, and 17 males and 12 females by dog hunters. Pickens County came in second with a total of 35 bears taken. Still hunters accounted for 14 males and eight females, while dog hunters killed three males and 10 females. Greenville County came in third with 27 bears taken including 16 males and seven females by still hunters, and three males and one female by dog hunters. The largest bear of the season that was taken weighed 597 pounds by Phillip Gosnell of Landrum in Greenville County while still hunting.